I had a great time this morning watching the creepy and frightening The Birds, Hitchcock’s follow-up to his all-time classic Psycho. San Francisco socialite Melanie Daniels (Tippy Hedren) met handsome lawyer Mitch Brenner (Rod Taylor) in a pet shop. Knowing who she was, Mitch had played a bit of a joke on her to put her in her place. Melanie wasn’t going to settle for that so she purchased two love birds and followed Mitch to his home town of Bodega Bay to deliver the birds. Melanie met Mitch’s overprotective mother Lydia (Jessica Tandy), his little sister Cathy (Veronica Cartwright) and an old flame Annie Hayworth (Suzanne Pleshette). As the human drama continued to play out, the local birds started to act in peculiar ways: a seagull struck Melanie on the head. A group of birds attacked a fishing vessel in pursuit of fish. Crows began to group up. Soon, these packs of birds were attacking school children, breaking into houses and pecking the eyes out of local residents. Mitch and Melanie desperately tried to keep his family safe from the deadly assault of these birds. The Birds is a fascinating film. First of all, it is extremely suspenseful. 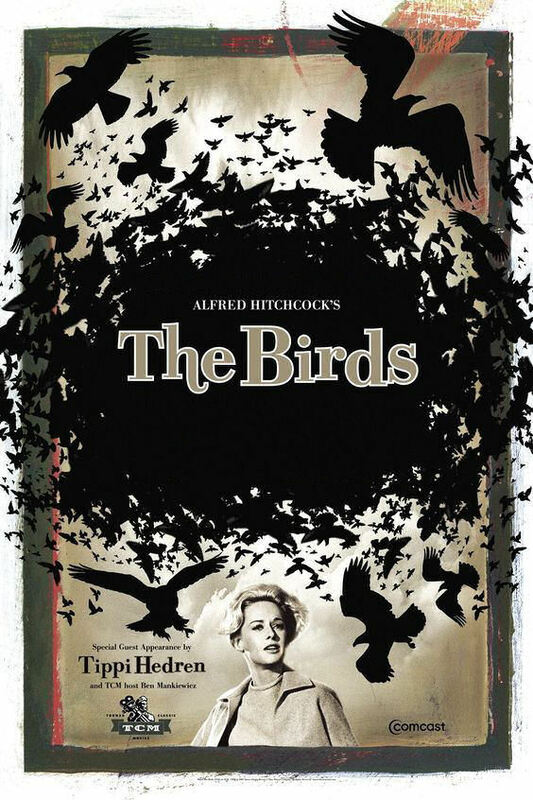 Hitchcock masterfully builds tension and suspense with each shot of the birds and the use of silence in the background. The first half of the film is spent on developing characters and their motivations and the horror elements of the film are placed on a slow burn. This worked brilliantly by building the anxiousness of the audience. Then, when the birds would attack, it provided even more of a shock to the viewers. I know that I shouted out loud several times (when the birds came flying out of the fireplace into the Brenner home, I blurted out). Making things even more tense for the audience is the fact that Hitchcock has taken a species that has never been aggressive, that have been docile, and turned them into monstrous killers. Birds are just a normal part of the world. In fact, you probably do not even notice that they are there. That only adds to the overall effectiveness of the sudden turn into creature features. Finally, the fact that Hitchcock does not take the time to give any reasons behind the attacks or any motive whatsoever makes the violence even more disturbing. There are several potential hints dropped throughout that could lead to answers. These include things like: “it’s the end of the word”, the constant shots of the two caged love birds, Melanie is evil and has brought this curse with her, poisoned bird feed, the birds are getting sick etc. Honestly, I prefer the open ended aspect of the film’s feathered felon’s motivation because it allows you to decide for yourself which of the obviously dropped hints are important and which ones were Hitchcock just playing with the audience. I suppose there is a strong chance that Hitchcock had no idea the real motivation and he just provided a series of possibilities to keep people talking. There are some tremendously iconic horror scenes in The Birds, including the children running in fear from their school and Melanie trapped inside a phone booth. There are some amazing shots that director Hitchcock placed in this film that creates such a wonderful tension in his viewers’ mind. Even the ending left the results in question, and I thought it was quite the ballsy choice. Hitchcock did not feel the need to wrap things up in a neat bow and the unpredictability of the whole film shows what a master filmmaker Alfred Hitchcock was.